Despite a cohesive Indo-pacific strategy and imminence of quadrilateral grouping of like-minded nations - India, Japan, Australia, and the US seem to be dawdling. Where is the problem - policy, finance, or the concept itself? The Indo-Pacific region is a place blessed with opportunities encompassing fast-growing countries like India, and the African continent which is full of potential. However, it is also a place where various challenges are arising including the threat of terrorism, proliferation of weapons of mass destruction, natural disasters, among others. These threats cannot be addressed by one country alone, as they have become global and complex in nature. In the Japan-India Joint Statement issued last September, the two Prime Ministers affirmed strong commitment to their value-based partnership in achieving a free, open and prosperous Indo-Pacific region where sovereignty and international law are respected, and differences are resolved through dialogue, and where all countries, large or small, enjoy freedom of navigation and overflight, sustainable development, and a free, fair, and open trade and investment system”. These values are echoed among like-minded countries including the US and Australia. Last November, the Japan-India-Australia-U.S. Consultations was revived and the second meeting was held in June this year at Singapore, where the four countries reaffirmed shared support for a free, open, and inclusive Indo-Pacific region. Furthermore, the four countries agreed to partner with countries and institutions in the region to promote the shared vision of rendering the Indo-Pacific region peaceful and prosperous, and to hold Consultations on a regular basis. At the same time, it should be noted that Japan-India-Australia-U.S. Consultations is one of many initiatives to promote a free and open Indo-Pacific. Japan-India-United States trilateral cooperation continues to play a crucial role in this regard. As India stresses, ASEAN centrality is the crucial element of the Indo-Pacific construct, and Japan is working closely with ASEAN partners and other like-minded countries in the Indo-Pacific region. What is the blueprint of (quadrilateral) partnerships among the four nations if one needs to understand the opportunities and challenges here? From the perspective of ensuring peace, stability, and prosperity of the region and the world, Japan has been deepening practical cooperation and holding discussions among the four countries in bilateral, trilateral and quadrilateral formats on common issues of security and maritime cooperation, including development, connectivity, counter-terrorism, and non-proliferation. The fundamental goal is to achieve a peaceful and prosperous region. Japan and India, which share common values, play a key role to achieve this goal. Our two countries continue to collaborate in a multilayered manner including bilateral, trilateral, quadrilateral, and regional formats. Our collaboration will be open, rule-based, and inclusive. India-Japan pledged to cooperate and connect Africa, Southeast Asia, and India’s Northeast as part of the $40 billion Asia-Africa Growth Corridor (AAGC) programme. Since its inception, it has not come up with any workable model so far. Where are we now on AAGC? When Prime Minister Abe visited the State of Gujarat to meet Prime Minister Modi last September, our two Prime Ministers pledged to align Japan’s Free and Open Indo-Pacific Strategy with India’s Act East Policy. I am pleased with the progress we have made since then. An important pillar is our mutual commitment to enhancing strategic connectivity in the wider Indo-Pacific region, including Africa. Japan and India are finalizing specific cooperation projects in this region, ranging from connectivity to skills development, and our efforts are bearing fruits. Another important offspring of this confluence of policies is the Act East Forum, where Japan and India are engaged to promote India’s Northeast development. I am pleased that the 2nd meeting of Act East Forum was held on 8th October and confirmed the future orientation of cooperation, ranging from road and bridge connectivity projects, forest management projects in States of Tripura and Meghalaya, a new initiative to utilize abundant resources of bamboos, to people-to-people exchange. Japan has pledged a total of 384.1 billion yen (US$3.6 billion) in loans to India in the 2017–18 fiscal year, which makes India the recipient of the most Japanese loans made to any country in a single year. It is a recognizable fact from the Indian side at large. But, how satisfactory is the project delivery in India from your point of view, keeping in mind the multitudes of factors often causing unnecessary delays? Official Development Assistance (ODA) projects are far more complex than generally thought. Their stakeholders range from the recipient central governments to state governments, executing agencies, constructors, and local residents. This fact could result in a delay as pointed out. As Japan enjoys a long history as a donor country for India since 1958, the Japanese government and its ODA executing agency, JICA, have accumulated substantial know-how in implementing ODA projects in India. In addition, the Japanese government, JICA, and their Indian counterparts have established a trust-based and cooperative relationship with one another. Japan takes pride in the fact that, as a result of efforts of all concerned, a majority of Japanese ODA projects have completed almost as planned, thereby contributing to India’s economic development. Going forward, we will continue to see to it that our joint efforts are smoothly implemented and produce expected results. Japan-backed Mumbai-Ahmedabad bullet train project has set up a completion deadline by August 2022. Can you please update us about the present status? But the biggest challenge for the project is land acquisition. Do you see that as a major obstacle? Do you see any substantial changes in India during the past 3 to 4 years in terms of project delivery? The Mumbai-Ahmedabad High-Speed Rail (MAHSR) project is a symbol of Japan-India friendship and will transform the transportation system of India. As such, Japan and India closely monitor the progress of the MAHSR project. On 17 September, we held the 8th Joint Committee meeting in Delhi. On 28 September, JICA signed an agreement with the Government of India to provide an ODA loan of 89,547 million yen (approx. INR 5,500 crores) as the first tranche for the MAHSR project. The Government of India is responsible for land acquisition of this project, and I understand that it follows all the necessary procedures required by JICA. I also believe that the National High Speed Rail Corporation Ltd. (NHSRCL) would continue to make efforts in addressing the interests of affected farmers and residents. With the growing commitment and professional work of NHSRCL, the mutual trust between NHSRCL and its Japanese counterparts is further on the rise. Japan and India are working cooperatively to follow through with the target operational commencement in 2023, stated in “The Progress Report of the Mumbai-Ahmedabad High Speed Railway Project” dated 7 October 2016. Also, Japan and India are having discussions on what can be done to celebrate the 75th anniversary of the Indian Republic’s independence in August 2022 in relation to the MAHSR project. 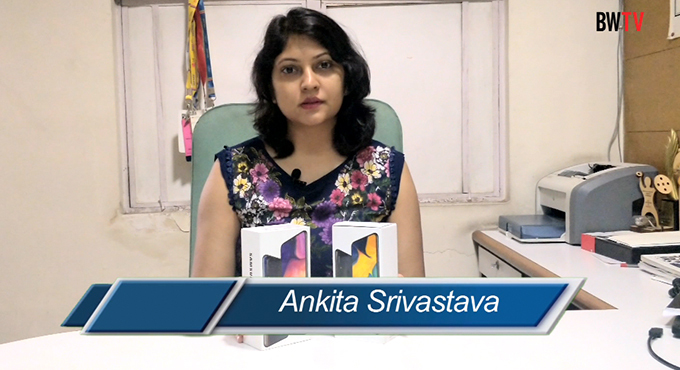 How easy is it doing business in India for Japanese companies now-a-days? What changes do you think are positively substantial? Besides, please tell us what more is required? Japanese FDI to India in Q1 of 2018 stood at USD 874 million, and Japan ranks as the third largest investor for India. The number of Japanese companies operating in India has registered a steady growth in the past, rising to 1,369 as of October 2017. As reflected in the World Bank's ‘Ease of Doing Business Rankings 2017’ in which India jumped 30 places to the 100th, I would say, the ease of doing business for Japanese companies in India has improved, thanks to several initiatives led by the Indian government. Among them is the introduction of GST in July 2017, a historic achievement that Japanese companies had longed for. I believe Japanese companies' ease of doing business in India will be further improved as the Indian economy adapts to the new tax system. 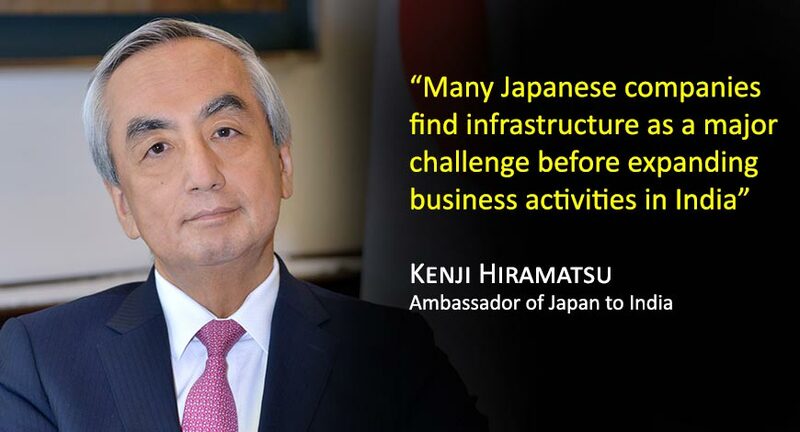 Meanwhile, many Japanese companies find infrastructure, e.g., electricity and transportation, as a major challenge before expanding business activities in India. Japan will continue to contribute to the improvement of infrastructure in India by providing Japanese ODA loans and private investment. I hope the Indian government continues to positively respond to various requests and suggestions from Japanese companies. Despite the strong investment relationship and the India–Japan Comprehensive Economic Partnership Agreement (CEPA), bilateral trade has dipped in recent years. India’s exports have halved to only US$3.9 billion from 2013 to 2017. Bilateral trade totalled US$13.6 billion in 2016–17 — a decrease of 6.21 per cent from the previous year’s figure of US$14.5 billion. What is causing the slippage in the bilateral trade? The trade between India and Japan is actually on an upward trend as a whole, if you take a longer perspective. I am pleased to see an increase in our trade in FY2017, amounting to USD 15,707.6 million; this is 1.5 times that of FY2007. I hope that more traders take advantage of the full potential that CEPA has unlocked, as represented by the 25.1% growth in trade volumes in the year following its entry into force. At the same time, I would like to point out that bilateral trade figures do not capture the whole web of our economic relations, when supply chains are getting more complex and Japanese corporate operations are increasingly globalized. 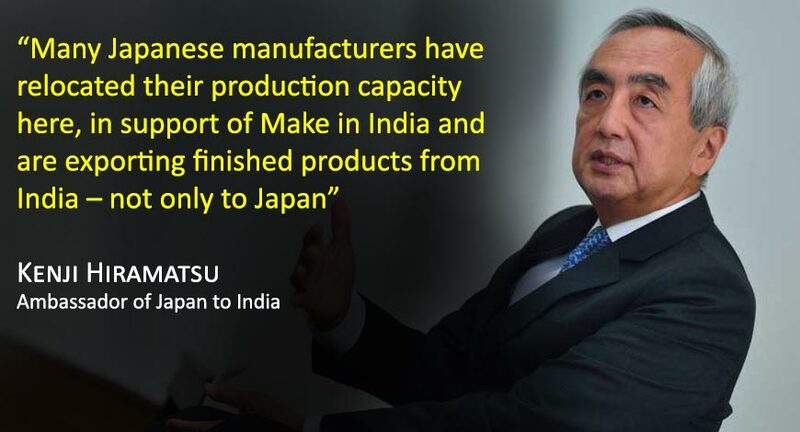 In a broader perspective including the robust investment by Japanese companies, many Japanese manufacturers have relocated their production capacity here, in support of Make in India and are exporting finished products from India – not only to Japan. For example, Maruti Suzuki exports 120,000 vehicles to more than 100 countries annually, accounting for 28.4% of India’s automobile exports to the world. The latest questionnaire conducted by JBIC in 2017 revealed that the highest proportion of Japanese companies continues to name India as the most promising long-term investment destination in the world. I hope that more companies including SMEs as well as diversified goods will arrive in India as the two countries become more closely inter-connected. Japan–India ties have never been looked at from an economic standpoint alone. In 2014 under Prime Ministers Narendra Modi and Shinzo Abe, the two countries decided to elevate the bilateral relationship to a ‘Special Strategic and Global Partnership’. Defence cooperation is one major agenda. How is it unfolding? Japan and India recognize the importance of cooperation in the defence and security area for strengthening our bilateral strategic partnership, and now, I think that the security and strategic relations are rapidly catching up with the progress already made in the economic field. We have regular and institutionalized engagements including the annual Defence Minister dialogue, National Security Advisor dialogue, Vice Minister/Secretary level “2+2” dialogue, Defence Policy dialogue, and staff talks. In terms of joint exercises, we would like to highlight the fact that our two navies conducted seven joint exercises in the past year alone. The strategic and symbolic one is the Japan-India-US trilateral MALABAR exercise, of which the most recent edition was carried out off Guam in June. More recently, JMSDF (Japan Maritime Self-Defense Force) and the Indian Navy held a bilateral maritime exercise called JIMEX (Japan India Maritime Exercise) in the vicinity of the Bay of Bengal in October. This exercise is not only to develop tactical skills, but also to enhance the cooperation for maintaining the rule of law in maritime domain under the Free and Open Indo- Pacific strategy. Furthermore, the first ever bilateral exercise in the domain of counter-terrorism between JGSDF (Japan Ground Self-Defense Force) and the Indian Army is to be held in coming months. Also, JASDF’s (Japan Air Self-Defense Force) participation in the next round of exercise ‘Cope India’ with the Indian Airforce and US Airforce will add further momentum to air-to-air exchanges. It is against this backdrop that the necessity of mutual logistic agreement between Japan and India was recognized in the Defence Minister’s dialogue in August, to facilitate further cooperation between our respective forces. I look forward to seeing progress in this area, which would definitely take our bilateral cooperation to the next level. When is the amphibious US 2 aircraft deal happening? Cooperation on defence equipment and technology is also a crucial area to be expanded. Japan has traditionally taken a rather cautious approach in this field, but with the new ‘Three Principles on Transfer of Defense Equipment and Technology’ approved by the cabinet in 2014, Japan is determined to contribute to international peace and security more proactively, through appropriate overseas transfers of defense equipment and technology. By doing so, we can also strengthen security and defense cooperation with our allies and partners. With India, we signed the ‘Agreement concerning the transfer of Defence Equipment and Technology’ back in 2015, and in July this year, we started the first research collaboration in the areas of Unmanned Ground Vehicles and Robotics. 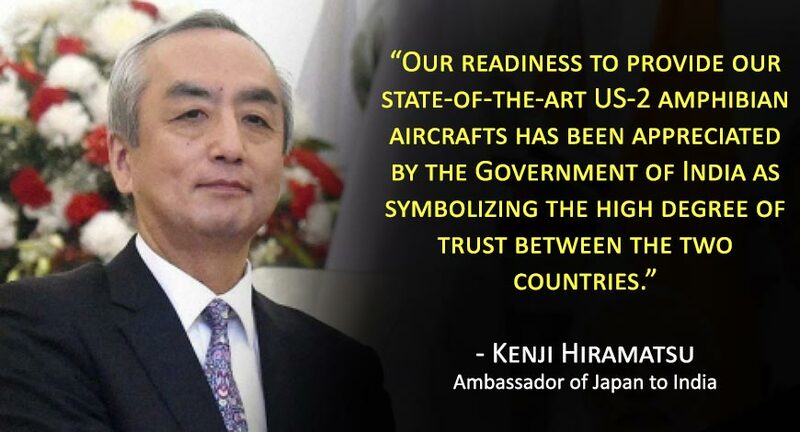 Our readiness to provide our state-of-the-art US-2 amphibian aircrafts has been appreciated by the Government of India as symbolizing the high degree of trust between the two countries. The two countries have been closely and steadily working together on this, and we look forward to making progress in the future. The Japan External Trade Organization estimates that Japan will have an 800,000-worker shortage of IT staff by 2030. India is well poised to plug this gap. How does Japan plan to embrace Indian workforce, with language as a major barrier? I believe there is a huge potential in synergizing India’s excellence in software and Japan’s advantage in hardware. In order to bridge a link between Japanese and Indian (primarily IT) companies, the Embassy has organized startup-pitching events twice in Delhi, while the Japanese government established the Japan-India Startup Hub in Bengaluru. We also invite Indian startups to an international exhibition called CEATEC this month in Tokyo. In addition, JETRO hosted a “Japan Career Fair” this February in Pune, and will host another in November in Hyderabad. To support highly-skilled professionals, including those from India, who seek permanent residency in Japan, Japan introduced a preferential immigration policy in April 2017. The new policy has drastically shortened the requisite period of residency before application, from 5 years down to 3 or 1 year. With respect to language barriers, Japan and India signed an MOC to introduce 100 Japanese language courses at higher educational institutions, during PM Abe’s visit to India in 2017. In July 2017, the two governments opened the “Japanese Language Teachers’ Training Centre in Delhi”, aiming at training 1,000 language teachers in the next 5 years. 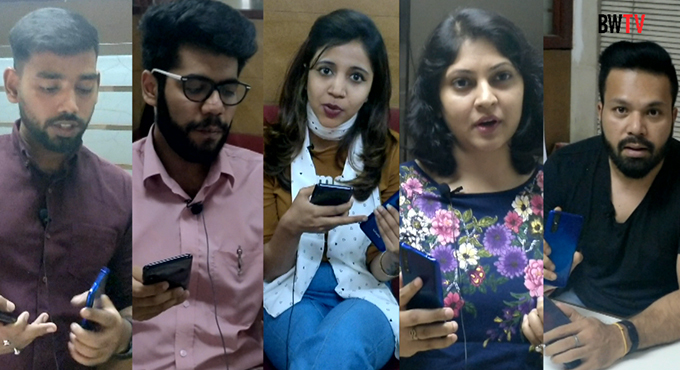 We welcome the growing level of interest in the Japanese language in India.